Britannia Industries, currently celebrating its centenary year, unveiled its new logo illustrating the company’s vision to become the ‘Future of Food’– Global Total Foods Company. The company’s logo defines its intent to be forward-looking, emphasizing the limitless opportunities that Britannia aims to explore while continuing to build upon the success of its power brands and transition into a global total foods company. Britannia acquired two companies, UAE-based Strategic Food International Co (SFIC) and Oman-based Al Sallan Food Industries 10 years back. “We have made remarkable progress in the GCC becoming one of the top three biscuit manufacturers in most countries. We are No. 1 in Cookies and Rusks, a close second in others and boasting impressive market shares across the entire range. We will launch ten new products in the GCC aligned with today’s trends during our centenary year. The offerings will be differentiated in various ways – new formats, more goodness and lots of excitement according to our brand promise. 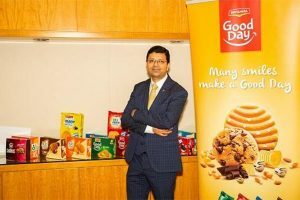 Britannia was the first Indian food company to remove transfats from its entire portfolio and has taken the lead in providing micronutrient fortification in 47 per cent of its products. Britannia has reduced the sugar content by six per cent per serving over the last six years and has committed to reducing it further by 5 per cent in next 5 years. Similar efforts are being made on the sodium content,” said Annu Gupta, head – International Business, Britannia. “Britannia has always taken its Corporate Social Responsibility seriously. It formally launched its community programs with the set-up of the Britannia Nutrition Foundation in 2009, and began working on a public-private partnership to address malnutrition amongst underprivileged children and women. “Outside India, we have the strongest presence in the GCC with over 700 employees from all the major ethnic groups in the geography. We have manufacturing facilities in Oman and the UAE. The UAE government’s business-friendly policies have offered us the right platform to expand our global footprint which is now spread across North America, Europe, Africa and South East Asia. October 2015, we were the proud recipients of the Dubai Eminent Exporter award from the Dubai Chamber of Commerce. “We have invested $22.5 million in a state- of- the- art facility in Mundra Special Economic Zone (SEZ), India to service the exports markets. Our strategic expansion plan is based on the principle of ‘One new market a year’ while we expand through local operations in Africa and South East Asia in the coming years,” he added.